For Christmas, Davis received a Memory Game. Our friends Adam and Paola told us that their little girl Bella loved hers and was really good at playing it, so we thought we’d get Davis one. After opening it, we laid out some of the cards and showed Davis how to make matches. He got frustrated and scrambled up all the cards. Tracy tried laying them face up and letting him make matches. He played it that way for a little while, got bored, and scrambled up all the cards. Eventually, after other attempts at playing the game, Davis decided that he would rather categorize the cards…well, some of them. 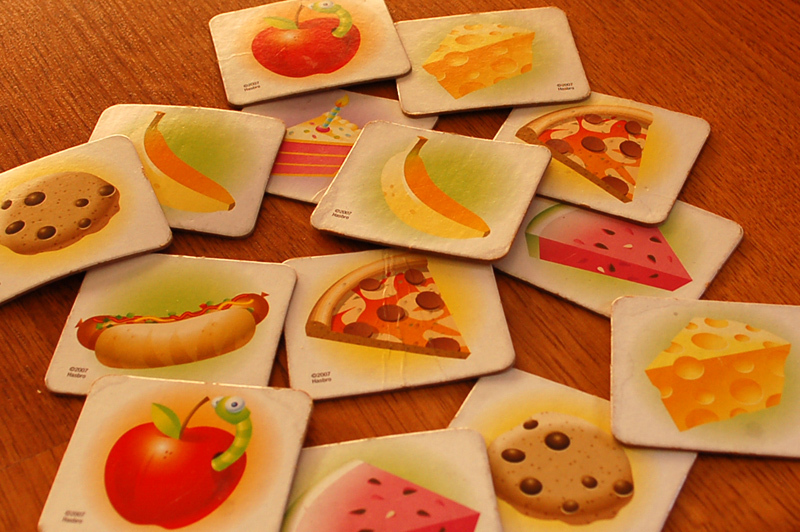 The only cards he is interested in are the food cards – the ones with the bananas, cheese, cake, cookies, and an apple with a worm in it (he calls this one an apple with a snake in it). He cares nothing about any of the other cards, but these food cards have become one of his favorite toys. He carries them around everywhere. When we leave the house on many occasions, Davis grabs a plastic grocery bag and loads it up with his food cards. When it’s bedtime, Davis says, “I want my food cards.” He falls asleep with them. He has even begged to take them in the bathtub with him. Tracy and I aren’t sure where the fascination with food cards has stemmed from or what it means. It could mean that he is such a genius that the memory game was too elementary for him and that he is laying in bed in the wee hours of the morning working on developing a more sophisticated game involving these food cards. It could mean that he is a going to be a chef and is using the food cards to begin writing a picture cookbook. Or, I guess it could mean the boy just loves food. i thought he didn’t love food anymore. my theory is that he is hoping the nutrition from the “food” will leech into his body so he only has to eat cheese for the rest of his life. cannon LOVES to scramble his flash cards. i put them in neat little lines and he FREAKS out. hates order! this could be an even better theory than mine – even after he threw up yesterday, he wanted to eat cheese – ick! It is possible that we have a budding food expert on our hands. He could be devising a child version of “GOOD EATS”!